It seems we’ve seen this movie before. Elaborate plans. An extravagant marketing effort. High-level diplomacy. And an utter lack of understanding of how local government works. It’s the county-wide transit plan, compacted and trimmed. Just a little over a year ago, the countywide transit plan, based on an Act 196 authority with a complex structure, was soundly rejected. As we reported over a number of months, the ungainly plan simply had a number of fatal flaws and most Washtenaw County units of government couldn’t opt out fast enough. This left the AATA in a precarious situation because of the “advance implementation” of the countywide plan (they simply assumed that the money would be coming from a countywide millage and spent in anticipation). We respect the opinions of our elected officials who have chosen to withdraw their participation in the proposed transit authority in favor of moving forward with a different process and a more compact authority…Washtenaw County’s urban core communities…have indicated a strong interest in developing an expanded transit network despite Ann Arbor City Council’s actions to withdraw from the new transit authority. These communities include the cities of Ann Arbor, Ypsilanti, Saline and the townships of Pittsfield, Ypsilanti and the Village of Dexter. Staff (especially Michael Benham, the chief planner for expanded transit) began working immediately and had some drafts for a committee to review by December 2012. The first “urban core” meeting was held on March 28, 2013 at the Pittsfield Township Hall. The meeting included officials representing different communities, including four Ann Arbor councilmembers. A large-format book with pages illustrating the Urban Core concept was provided. Urban Core meeting of March 28, 2013. L to R: Daniel Cherrin & Brian Pappus; Shawn Keough, Dexter; Peter Murdock, City of Ypsilanti; Paul Schreiber, Mayor of Ypsilanti; Mandy Grewal, Supervisor, Pittsfield Township; Spaulding Clark, Supervisor, Scio Township; Charles Griffiths, AATA chair in foreground. Two more meetings were held on April 23, 2013 and June 27, 2013 (packets are linked). The meetings were facilitated by Daniel Cherrin and Brian Pappus, who were working as dispute resolution volunteers (an odd note, since this was not exactly a dispute). They brought a fresh approach to the process, as they had no particular knowledge of transit and had not been associated with the long earlier process. An early draft of the concept (presented at an AATA meeting in December) had included Scio, Ann Arbor and Superior Townships. However, Superior Township was not represented at all at the March meeting, and some others were just along for the ride. Supervisors Spaulding Clark of Scio Township and Mike Moran of Ann Arbor Township pretty much indicated that, while Shawn Keough of Dexter joked that he was there to explore “getting on the map”. 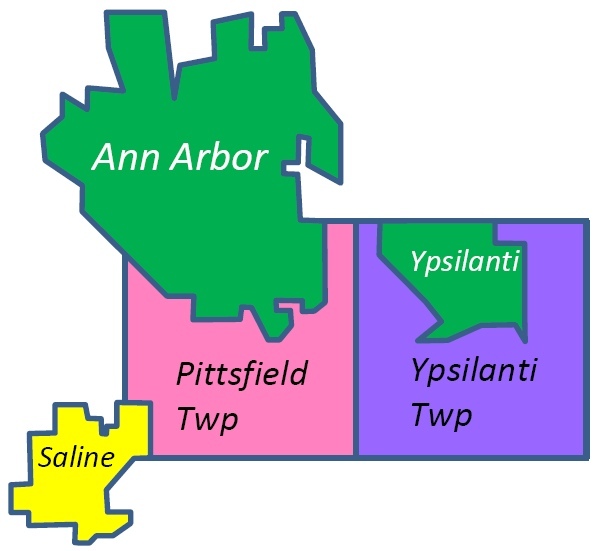 It was clear that the two Ypsilanti communities and Pittsfield Township were the major likely players in an expanded authority, possibly along with the City of Saline. Brian Marl, the Mayor of Saline City, was very positive but it became evident that they wouldn’t play much of a role (Saline is currently served by People’s Express and does not currently have a relationship with AATA.) . The outline map has continued to include Saline. One of the tasks was to decide on which of four options would be pursued. These were either to keep the current service levels, improve service in Ann Arbor, expand service elsewhere, or to “Improve & Expand”, the full package. But in addition, a tinge of the ambition for the county-wide plan persisted. (AAATA has not disavowed the 5-year plan from the TMP, but has instead said that much of that is still valid.) A slide, “Beyond the Urban Core” proposed that an expanded authority might still engage many entities outside its borders. Process at the first meeting was a bit wobbly, with the officials present taking some time to meet up with the earnest efforts of the moderators to organize a real working structure. The objective, to form two working groups on governance and finance, was never met. But the group did more or less accept the idea of the “Improve & Expand” option, in the sense of a “consensus” (no one actually objected). An obstacle to this process was that no one at the meeting actually had the authority to commit their respective communities to anything. Local governments have processes and requirements of their own. Leaders may lead, but they still must obtain a resolution from their elected councils or boards of trustees. AATA has had some trouble with understanding this in the past. With the countywide plan, they seemed to think that having gathered some good people around a table and having made numerous presentations without strong objections being voiced, they were good to go. But after a year’s laborious effort to achieve an Act 196 countywide authority, Washtenaw County communities couldn’t opt out fast enough. In this case, the people at the table were significant elected officials who could evaluate and discuss the concepts being presented, but who were necessarily circumspect about making commitments. An exception: the City of Ypsilanti officials present, especially their Mayor, were passionate about the need for a new authority that they could join. The reason: though the city’s voters approved a charter millage to pay for bus service, they were limited in the amount that they could levy by state law (they are at their 20-mill constitutional limit). At the April meeting, where a number of different governance models were reviewed, there was a burst of discussion which resulted in the addition of the City of Ypsilanti into AATA, thereby cementing the Act 55 authority as the likely vehicle for an “urban core” authority. That move has been completed, with the addition of two new board members, one representing the City of Ypsilanti, one appointed by Ann Arbor. The Act 55 authority is now called “Ann Arbor Area Transportation Authority” (AAATA), though the marketing staff prefers simply “The Ride”. The final paperwork has now been executed that will commit Ypsilanti’s millage to the AAATA. So by the third meeting, the situation was that we had a two-unit authority with possible participation by three others, perhaps by use of expanded Purchase of Service Agreements (POSAs). This “Improve & Expand” model, which received approval not by any vote but because no one objected and all seemed to agree in principle was a nice idea, was said to have a $5.4 M annual price tag (additional funding needed) by 2019. 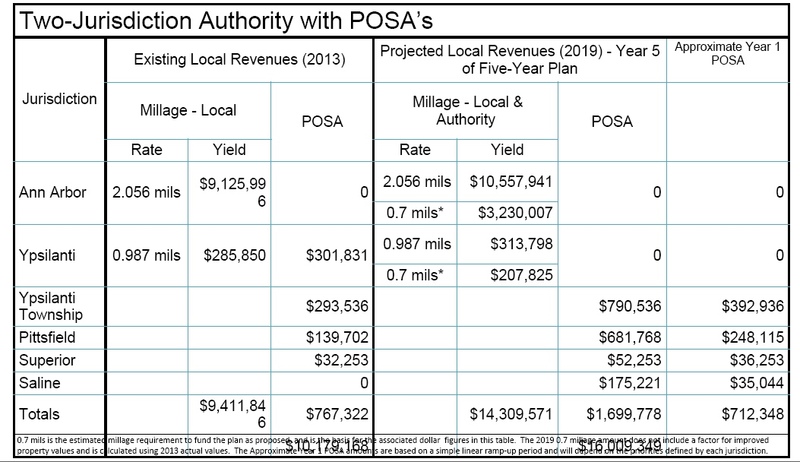 The financial model provided at the June meeting supposes that much of that will be met by additional POSA spending by Pittsfield, Superior and Ypsilanti Townships, and the City of Saline. In addition, the cities of Ann Arbor and Ypsilanti would agree to pay a new millage levied by AAATA, now supposed to be 0.7 mills. Note that more funding is needed just to make up the shortfall in Ypsilanti’s current millage payment. AAATA is still paying for their earlier advance implementation of the countywide plan. But will the respective governmental bodies actually approve funding for this expansion? And will voters approve a new millage? Plans are being made. Once again, AATA (now AAATA) is moving us forward with a broad expansionary vision, but is dependent on local politics. This entry was posted on October 19, 2013 at 3:29 pm and is filed under civic finance, Regional, Transportation. You can subscribe via RSS 2.0 feed to this post's comments. You can comment below, or link to this permanent URL from your own site. Seems like I’ve read this blog before, Vivienne. Once again, elaborate recounting of carefully selected facts giving your jaundiced and subjective conclusions a veneer of academic respectability. In an era when we can’t afford either to isolate our communities or to link them solely by private automobiles, the clear path to prosperity in Michigan is through regional cooperation and investing together in alternative forms of transportation. We can’t afford *not* to make this investment now. Those who think it’s foolish to diversify our transportation options are neglecting the huge expense of our current dependence on automobiles and petroleum. On a more personal note, since I live in Ypsilanti Township, I don’t understand why you’ve decided to start a smear campaign against the current administration of the Township. I can understand that as a County Commissioner you were on the opposite side of the dispute over the cost of police services in three townships including Ypsilanti. But to edit the facts to such a degree in your earlier blog – particularly leaving out the root cause of the law suit, which was the County’s alleged breach of contract – puts you in a class with mud-slingers. Your statement to the AAATA Board during the September meeting was nothing more than insulting to the intelligence of the Township administration. “[T]he township evidently has expectations of considerably expanded service that are based in turn on the passage of a millage in the near future. From reading the minutes of their meeting, I am not convinced that they understand this.” How would they not understand that? They’ve managed to keep a balanced budget through drastic revenue shortfalls during the last four years, and passed four millage issues to bolster revenue. They do a competent and responsible job providing services and protecting their constituents. They fight for what they believe is right for their residents; they’ve taken pay cuts and reduced the hours of staff with very minimal reduction in personnel. Yet you don’t believe they even know that service requires revenue? You’re so convinced of their lack of rudimentary intelligence that you’re willing to stand up in front of the AAATA Board and say so? Vivienne, this has blown your cover as a responsible “fact-finder” and totally ruined your credibility. I’m glad the AAATA Board is willing to continue to do the responsible thing, which is to work for better and wider service to our area as a whole. I also don’t accept your view that the County was guilty of a breach of contract and I attempted to document that history fully in my prior post. Yes, I certainly agree that the current Ypsilanti Township administrators are intelligent and capable. I simply think that they will always try to get the best deal in a business relationship. I don’t think that is a “smear”, merely descriptive.